The Help to Buy scheme continues to grab the headlines, with its success rate for getting first-time buyers onto the property ladder. A recent study from the Ministry of Housing, shows that almost half a million completions have taken place since 2013, with 430,000 of these completions made by the first-time buyer market. There was a total of 494,108 completions, which have taken place using one or more of the governments Help to Buy schemes, over 93% of which took place outside of London. The average house price purchased through the schemes, was around the £200,000 mark. First-time buyers have now opened 1.4 million Help to Buy: ISAs offering government bonuses of up to £3,000 on top of their savings. These figures highlight how invaluable the Help to Buy scheme has become, and how it will continue to support home buyers into the next decade. It has also helped prop up the new build sector and provided housebuilders with a solid target plan for the delivery of new homes. Demand will continue to grow for new build homes even though some questions arise around the price, value and borrowing requirements and affordability. Build quality and energy efficiency standards attached to new build properties continue to be a primary focus for the property developer sector. Help to Buy has certainly created a positive pathway for the growing numbers for first time buyers, housebuilders, lenders. Launched on April 1st, 2013 and available until 2023, help to buy is an equity loan scheme. Under the scheme, the buyer is only required to find 5% of the property value for a deposit. The government then lends you up to 20% of the value of the property in the form of an ‘equity loan’. The remaining balance can then be topped up through a mortgage. There’s no interest to pay on the equity loan for the first 5 years, after that the interest kicks in at 1.75%. It’s open to both first-time buyers and home movers, but it is restricted to new build homes. From April 2021 onwards only first-time buyers will be able to apply. When you come to sell your home, the government will take back its 20% share. If you don’t sell, the money is due back after 25 years. The idea with the help to Buy equity loan is that, because you’re theoretically only borrowing 75% from the mortgage lender, payments will be lower than if you had used a 95% mortgage. Help to Buy is a great route to get onto the housing ladder, or to even upsize your house if you are wanting to start now. But you must be quick, as its not going to go on forever! 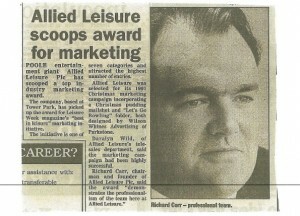 Richard Carr is a former business owner and entrepreneur, with one of his first business ventures being with Allied Leisure. Born in 1983, Richard Carr built a business of Counter Service Fast Food Restaurants predominately in London and the M3 corridor. The business was floated on the USM in 1987 before being sold to Grand Metropolitan for £13m in 1990 and re-named Allied Leisure PLC. Richard left the company in 1994 to pursue a career in private ownership; this was after the business had been listed on the London Stock Exchange. Richard Carr operated in the nightlife economy for a number of years, owning and running a variety of nightclubs and bars. He also created the hugely popular ‘Slinky’ brand, which saw huge events hosted across the globe with some of the world’s biggest DJs. 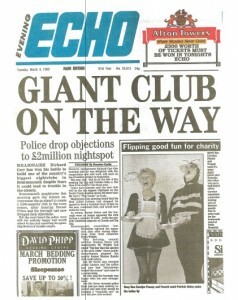 Richard Carr made the front page headline of the 1992, March 3rd edition of the Evening Echo after the police dropped their objections to his £2million nightspot. He won his battle to build one of the country’s biggest nightclubs in Bournemouth despite the Police’s fears that it may lead to trouble in the streets. However, Bournemouth magistrates gave Richard Carr the go-ahead to create the 2,000 capacity club in the town centre. Although the police had dropped their objections they told the court that if trouble ensued, they would object to the club renewing its operating licence. 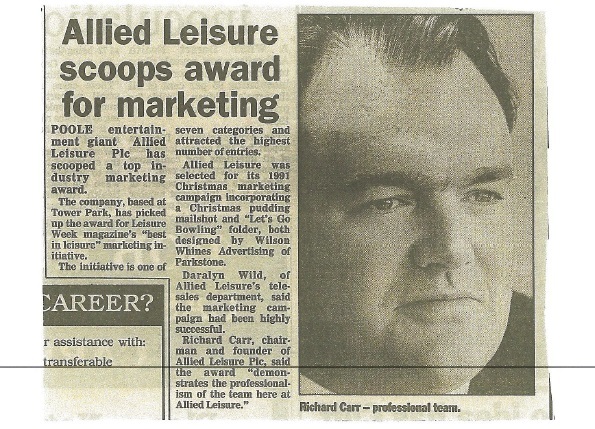 Allied Leisure was one of Richard Carr’s first business ventures and one that saw him combine fast food counter restaurants, bowling alleys and a leisure complex. 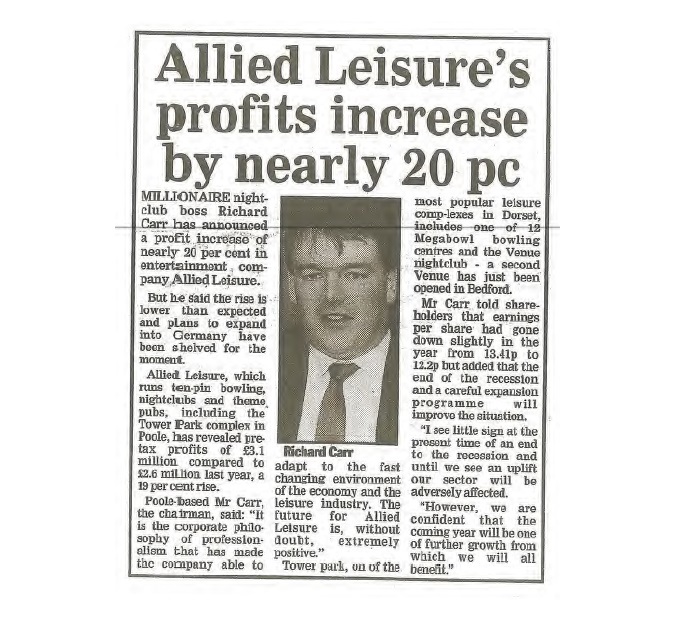 Looking back at the company’s rise under Carr, we look at an archive article regarding Allied Leisure’s profits rise. Despite announcing 20% profit increases, Richard Carr explained that the rise was below expected at the time and that plans to expend the business into Germany have been shelved for the moment. 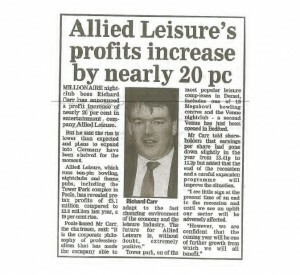 Allied Leisure, which ran a ten-pin bowling alley, nightclubs and theme pubs, including the Tower Park complex in Poole, revealed pre-tax profits of £3.1 million compared to £2.6 million the previous year, a 19% rise.